The price of renewable energy product is not the way to distinguish the different makes or types of products. If money was not the deciding factor, would you purchase the best or settle for a second rate renewable energy products? If you want the best don’t let money choose for you, allow Solartech West Coast to share financing solutions that will enable you to make the right purchase. Our products are backed with reputable service to solve your energy needs. The most cost effective way of raising finances will be through your current bondholder of your home. If you have had your current bond for a few years, most likely the balance owing is less than the original registered bond amount. Simply by phoning your bond holder and making an application, your bond holder should advance you the funds to purchase renewable energy products. The value of your home will be increased. Apply for a second bond from your current bondholder. This will even enable you to purchase a photovoltaic system and generate your own electricity from the power of the sun. The purchase of renewable energy products can be made with your credit card. Most credit card providers offer a budget account facility. This allows purchases to be made with extended payment duration of 24/36 month. Verify your budget limit to ensure that it is sufficient to purchase the products. If your budget limit is insufficient, simply call your credit card provider and request an increase on your budget account limit. Thank you for choosing GreenFin as your Finance Partner for your Green Energy clients. We hope that this partnership will increase your sales volumes and provide your clients with easy and affordable tailored finance options for the sustainable energy market. This document serves as a short summary of valuable information for your clients and the related procedures to follow, as well as the benefits and conditions of financing Green Energy conversions. GreenFin will pre-approve clients with clean credit records and contact them directly to complete the rest of the application process. At GreenFin we also live the Green Philosophy. Only the final Loan Agreement as required by South African courts needs to be submitted in original form via courier to our offices. GreenFin only approves clients with a clear credit history that passes our internal affordability test. Final credit decisions are submitted back to the original source of application (client or supplier). Only approved clients will get formal quotations (valid for 7 days only). The client will then pay the supplier the remaining 50% once the installation is complete. Alternatively the client can choose to pay 100% to the Supplier on instruction. South Africa has natural resources like sun and wind in abundance compared to many other counties around the world. Making South Africa the ideal business opportunity to invest in renewable energy to exploit cutting edge technolodgy to give one a competive price advantage over ones competitors. Eskom has the monoply to supply electricty at whatever price they want to charge. 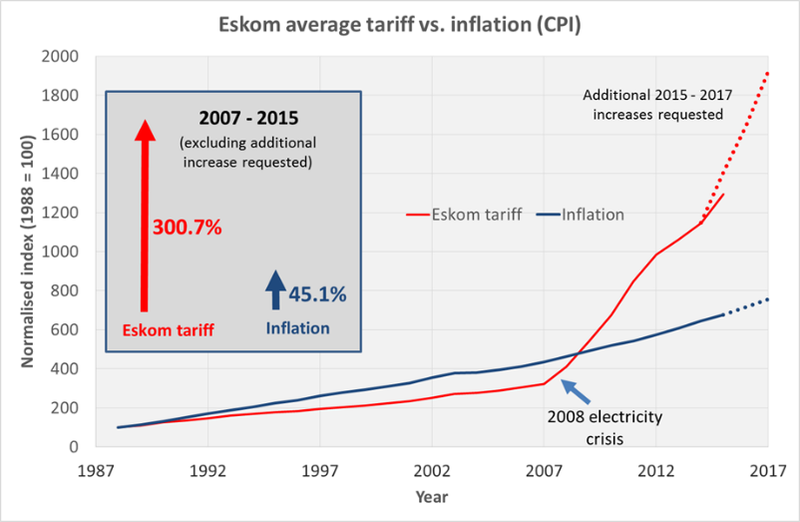 The past eight years Eskom prices has risen well above inflation, in fact more than 300%. 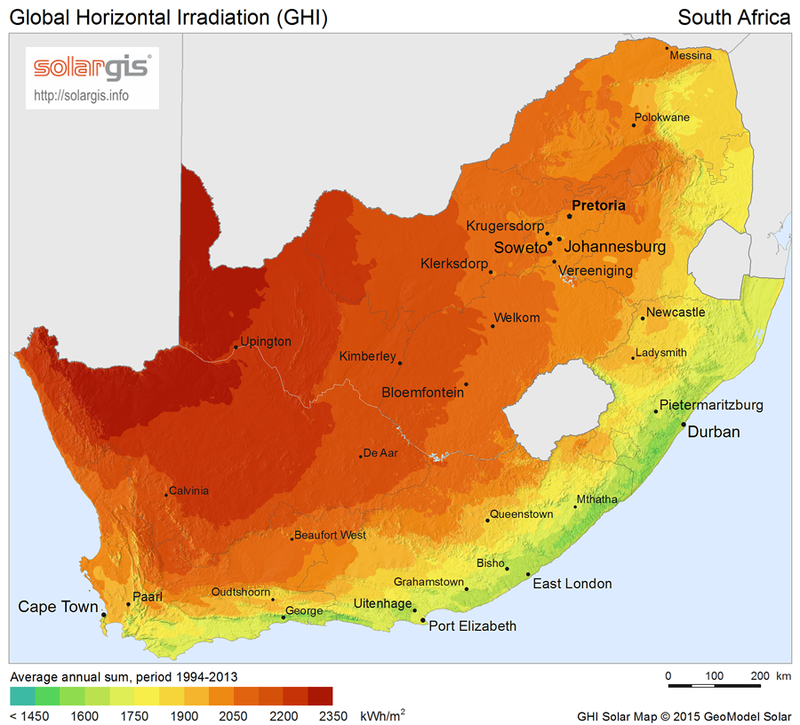 It is possible to fix electricty costs now to below R0,95 cents for the next twenty five years with solar electricity. Ownership of equipment isn’t what it used to be. Not when it comes to technology, where your company gets stuck in a cycle of paying for rapidly depreciating assets. Modernization requires out of box innovative thinking, not only for your products/services but also financing methodology. equipment is rented and no longer purchased. More and more South African companies are seeing the financial advantages of rental finance agreements. No deposit required, therefore access to working capital is enhanced. Why use working capital that can be turned into a profit instead of a depreciating fixed asset? Support business expansion and investment – Working capital is freed up thus improving cash forecasting and budgeting. VAT is not capitalized, therefore saving on interest charged over the full term. Maximising tax advantages for your financial benefit. Streamline fixed and moveable asset acquisition – Develope a financial solution that will compliment your specific business vision. Ownerships options available at the end of term. Client can chose to continue to rent at an agreed reduced rate. This is a simple option of “Outright Purchases” of equipment with capital from the business, thus ownership of the equipment is immediate. One knows exactly upfront what the cost are.The biggest advantage there is no financing costs. Most grid tie systems will pay for themselves in five to seven years with a commercial investment. Rental equipment are 100% tax deductible as an operating expense. The capex budget is therefore not affected by capital expenditure constraints and allows the user flexibility to upgrade within the rental period, or the fiscal year. Valued Added Tax is not capitalized on the agreements, but paid monthly on the rental. This provides valuable savings at the time of upgrade as VAT is only paid for the period the equipment is in use. As from 1 January 2016 Section 12b of the Income Tax act was amended from a three year (50% – 30% – 20%) accelerated depreciation allowance on renewable energy to an even quicker depreciation of 100% allowance in the first year, in respect of photo-voltaic solar energy of less than 1 megawatt. The reason for the change is to accelerate and incentivise the development of smaller photo-voltaic solar energy projects. This is also intended to help address the energy shortages facing South Africa in a more environmentally friendly way. An excellent designed solar solution will provide a significant return on your investment in solar products. Investment in solar will make a difference to saving our planet, clients appreciate and reward green thinking businesses. Simultaneously you will save on operating costs thus making the bottom line look good with greater profits. If you want further details, please contact us for a consultation. 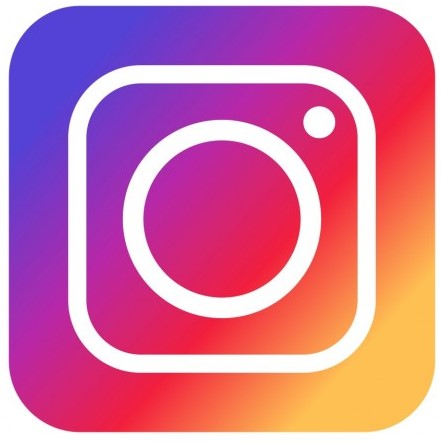 What are your contact details for enquires or new applications? GreenFin provide loans to private individuals only. GreenFin does not provide finance to companies but do offer finance to the directors of a company in their own capacity, should the company wish to install Green Products. What is the minimum and maximum period of the loan? What is the minimum and maximum amount of loans? GreenFin offers competitive rate according to the client’s credit and affordability profile. Why do clients have to take out Credit Life Insurance? GreenFin has negotiated a low insurance rate with Regent life and passing on this saving to the consumer. We cover the client’s outstanding loan balance repayments against death, disability and a period of loss of employment. Yes, however clients need to submit a cession letter from their existing insurance to GreenFin that covers 100% of the GreenFin Loan Balance. Such a process takes long and will hold up the final loan approval. To avoid this we have formulated the best insurance on offer as part of the package. Why use GreenFin and not my own bank? GreenFin has developed a product just for renewable energy where clients can finance a range of sustainable energy products without the hassle of going to their bank. We offer no queues at bank, easy online application process, competitive interest rate and a close working partnership with approved suppliers. GreenFin also offer a FIXED interest rate at the same low interest rate that most banks offer only as variable. GreenFin is a privately funded company. GreenFin understand niche market products and cater for Green Energy Finance Solutions at the same rate or better rate than most banks can offer. GreenFin is not funded by the Government, DTI or any other sponsored program. Can I settle my loan earlier, what the cost? YES – upon requesting an early settlement quote, and there are no early settlement penalty fees. Can I pay in advance or capitalise my payments? YES - payments will reflect as advance payments and shorten your repayment period and total interest amount. Do you finance impaired credit records or people under Debt Review? NO - this is not advisable as this is an illegal and dangerous practice. Can we link our website to GreeFin or offer an online calculator? YES - GreenFin can also link our “Apply Now “to your site. You can also offer a banner on your website to show your finance capability. Some suppliers choose to include this with a finance sticker on the quote. Can anyone offer GreenFin Finance to clients? NO - GreenFin has certain strict minimum criteria and registration specifics that our partners need to meet. We are proud of our product and only work with partners that are also proud of their product and name. We also have minimum guarantees and maintenance criteria and would remove any partners from our list should there be proof of poor workmanship and/or failed guarantees or warranties.